Behind three players in double-figures, the George Mason men’s basketball team snapped a five-game losing streak with a 68-60 victory over Saint Louis Thursday night. Shevon Thompson led all scorers with 19 points and 14 rebounds. Thompson picked up his 10th double-double of the season leading the Patriots as Corey Edwards recorded a new career-high with 16 points. Marquise Moore capped Mason’s trio in double-figures with 15 points to go along with five assists. 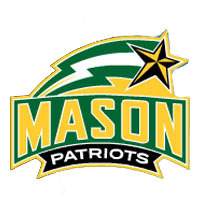 Thompson’s game-leading 14 rebounds helped Mason to a 32-25 rebounding edge as the Patriots shot 45.2 percent from the floor and 82.4 percent from the charity stripe. After erasing an early deficit, the Patriots used a 14-6 run midway through the first half to lead 24-21 off a Moore jumper with 3:36 to play. Mason led by as many as six twice in the first half and carried a 29-24 lead into halftime. SLU held a narrow 13-12 rebounding edge at the break, but Mason’s 47.4 percent shooting effort and 10-for-13 free throw outing put the Patriots on top at intermission. SLU opened the second half with a trey and cut it to two points, but Mason used a 10-0 run to pull away with a 12-point, 41-29, lead with 15:52 on the clock. The Patriots would hold a double-digit lead the majority of the second half and fought off a late Billiken rally as the visiting squad came within five points when Milik Yarbrough hit two free throws at the 6:30 mark. Mason would go 15-for-18 from the free throw line over the final seven minutes to seal the victory. Yarbrough and Mike Crawford led Saint Louis each with 14 points, while Davell Roby added 10. After both teams committed 10 turnovers a piece in the first half, the teams combined for just nine in the second half. Mason out-rebounded Saint Louis 20-12 in the final period and was 18-for-21 for the half at the charity stripe. Mason faces a quick turnaround, traveling to Duquesne for a 7 p.m. tip on Saturday.